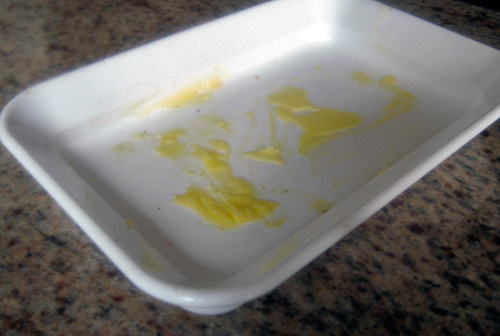 Wait, why did Lizzy post a picture of an empty butter dish? Because I thought that a Before picture would be more blog-appropriate than the After shots of what happens when a 10-pound pug eats a half-pound of butter. You’re welcome. And so ends her second emergency vet trip in the month of July. Oh, did I forget to tell you that one? Yeah, a few hours before my birthday dinner — minutes before I was meant to walk out the door to hit the World Cup fan park for the amazing Netherlands-Germany game — she hopped up on the counter and helped herself to most of a pan of almonds that I had been toasting for that evening’s salad. All of the “my dog ate…” things I’ve had to google (a scorpion, 20 vitamins, poo, etc.) have always turned out to be totally benign, but searching “my dog ate almonds” returned nothing but POISON! EMERGENCY! URGENT! So we headed off to the vet. Do you know how they induce vomiting in a dog? Do you want to? Are you sure? They squirted liquid morphine into her eyeballs. And then sent us out to the yard to walk around so that I could hold Roxy’s hair while she unloaded some almonds. 6 golf-ball sized mounds of nuts later (and some very judgmental sass from the receptionist), we were on our way. Anyway, although eating 5% of your body weight in butter isn’t good for anyone, it turns out it’s not toxic. We only went to the vet because we were already out and one of us was hurling drawn butter in the passenger-side floorboard. They said that since she was already rolling, to just let it run its course. We’re in a nerve-wracking eye of the storm right now, where the barfing has stopped and all is quiet. I feel certain we’ve not seen the, um, ‘end’ of things. Wish me luck. Hey guys – sorry about Roxie’s recent gastro-escapades. Due to Jackson’s previous eating habits (corn cobs, tennis balls, 18 year old cats, etc.) I have much dog vomiting knowledge to pass. The easiest way to get them to puke is to use an eye dropper to squirt a little hydrogen peroxide down their throat. Vomiting comes quickly after – so step back. This can save you a trip to the vet and the stress of applying morphine to her eyeballs. We have learned that Koda is part mountain goat and will continue his predecessor’s eating habits. Tracy had an entire pork tenderloin slow-cooking on the kitchen counter. Somehow, said mountain goat dog was able to get up on top of the counter and clean out the entire crock pot – several pounds of meat, potatoes, onions and broth. It looked like it had been washed and was ready to put away.